The implications are profound for the relocalization of production. With basic heavy fabrication, power electronics production capacity, 3D printing, industrial robotics, hot metal processing, and precision machining - we gain the capacity to produce just about anything. By making all of our production and automation equipment open source, we can produce more cost-effectively than China. Until then, we are forced to source from China, as we collaborate with our Chinese brethren on going local. The estimated development cost for the full open source microfactory that is capable of producing solar grade silicon from sand and steel from scrap is $100M. We have already put in about $3M into this effort over the last decade. Thanks so much for your support, and that Khan Academy and Global Village Construction Set were your top picks of this TED. 1. Design of a scalable, open source stepper motor controller for applicatios in all types of CNC machines; millable on a CNC Circuit mill. There are many designs out there, but they are typically not scalable and are low power. 2. Design of an oxyhydrogen generator for oxyhydrogen torch cutting of metal, including design of a flashback arrestor. The above are for our open source torch table. We are considering working with this guy build his 5 axis torch/router table - we just made contact to see if he's on board. 3. Design of the metal shear element for an ironworker machine. This, will go into the same machine as our 150 ton hole puncher. 4. Design and build of a CNC electronics router for making circuits such as the stepper motor controller above. We are considering CubeSpawn as as the structure/motion platform for this router. This project would simply be integration of open source stepper motor controller, router head, and CubeSpawn platform. CubeSpawn has already worked out the precision motion an it looks like a really robust and low-cost system. That's a start. Are you reachable on your mobile phone? I wanted to discuss the open source microfactory. I am attaching a concept draft, description below. If you find the following compelling, let's talk at greater length about the strategy to fund it - where simply collaborating on Kickstarter may be sufficient. If we do it right, we can have a Kickstarter Hall of Fame project comparable or better than Diaspora. We're now preparing for a Kickstarter campaign. The concept is an Open Source Microfactory.The kickstarter base offering ($20k) includes complete fabrication drawings and CAM files for a self-replicating, Open Source Torch Table (Prototype I completion + 2 further iterations up to Full Product Release), and an Open Source Tractor (Prototype III and Full Product Release). The Torch Table can be used in many applications, and the two specific, high-value applications provided in this offering include: (1), cutting out a replica of most of the Torch Table's own structural parts (self-replication), and for producing most of the parts for a full-sized, design-for-disassembly (bolt-together) Open Source Tractor. To reduce the cost of fabricating the Torch Table, the complete plans for a Scalable, Open Source Stepper Motor Controller are included, as are the complete plans for a CNC Circuit Mill (based on the CubeSpawn platform) for fabricating the Stepper Motor Controllers. This offering also includes the full fabrication drawings for an Open Source Oxy-hydrogen Cutting Torch of 1/8” to 3” thick cutting capacity, so that torching gas can be generated on-site via electrolysis of water, thereby eliminating both: (1), the cost of oxygen and acetylene gases for oxyacetylene cutting, and (2), the need for a plasma cutter for clean, warp-free cuts (oxyhydrogen cutting is sufficient). Thus, the base offering includes the Torch Table proper, 2 explicit products that can be made with this torch table, and the ability to build the electronic controller. However, that's what you get with $20k. If we exceed this amount, you get: $40k: CNC Precisaion Multimachine - a mill, drill, lathe, surface grinder with 4 foot long bed and scalable bed design so that any length bed can be made with up to 1 mil precision over the entire bed. This multimachine can produce 20hp hydraulic motors and 50kW electrical generators, for which we will provide complete plans. Complete plans for the xyz table for this machiene will be included, such that a high-performance, high power CNC Multimachine can be produced at about $3k in materials. This also builds on the open source stepper motor controller and the ability to produce the same with the circuit maker in the base offering. $60k: 50kW induction furnace prototype. This now gives us the ability to produce metal feedstock from scrap metal, to build components like hydraulic motors and electric generators above at the cost of scrap steel plus copper windings. This also reduces the cost of the precision multimachine, to perhaps $1k in materials, if structural steel components can be cast. $80k: First prototype of a scalable (extensively and intensively) modern steam engine. This now allows for power production to run the above infrastructure - such that we can power tractors or induction furnaces using local biomass pellets. Full plans for an open source pelletizer are included. $100k: Compete plans for a MIG welder and a 150 ton hole puncher that can be built at super low cost (under $1500 for both). Also, a compete Open Business Model for replicating RepRap 3D printers (Mendel) is included in this. $200k: Complete open source plans for a 6000 square foot facility for extraction of aluminum from Clay at a rate of one ton per day. Science fiction? No, just a locally-fuelled option for producing metal from dirt beneath our feet using proven processes developed in the 1980s, and whose patents have expired. Any money over this will be contributed to improving the quality of documentation for the above developments as needed. Any money over that still will be used for further Global Village Construction Set Development, focusing on completion of the flexible fabrication items. This is intended to constitute an open source flexible fabrication facility whose scope includes robust fabrication tools and products that can be made with these fabrication tools. Because this microfactory includes the capacity to melt metal and precision CNC machining, high-value components can be made at the cost of scrap metal. 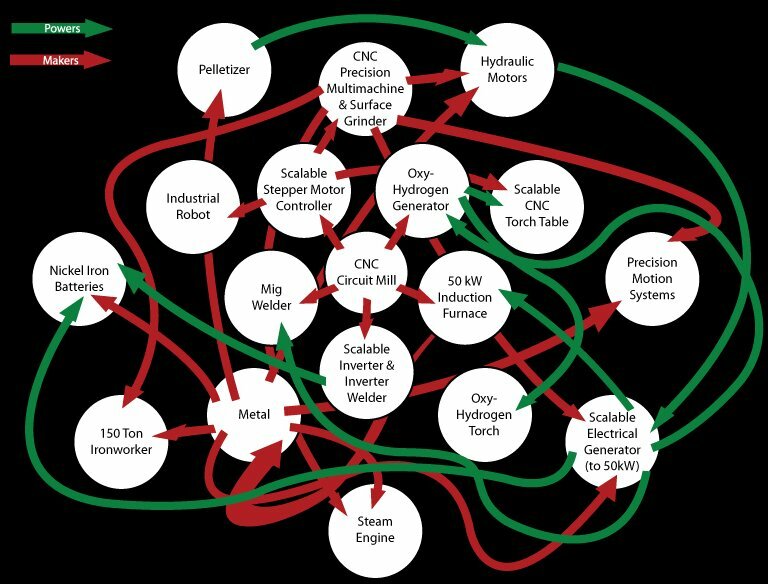 Because this microfactory includes the capacity to produce engines, motors, electrical generators, and oxyhydrogen generators, it is self-sustain in power, electricity, and cutting gas. Because this microfactory is scalable by design (intensively and extensively), a number of economically-significant enterprises can be created from this microfactory, whether for rebuilding local economies or for developing world applications.